Japan; 2Institute for Biosciences, Mukogawa Women’s University, Nishinomiya, Japan. Received September 1st, 2011; revised September 25th, 2011; accepted October 15th, 2011. Cordyceps sinensis, a parasitic fungus on the larva of Lapidoptera, has been used as a traditional Chinese medicine. 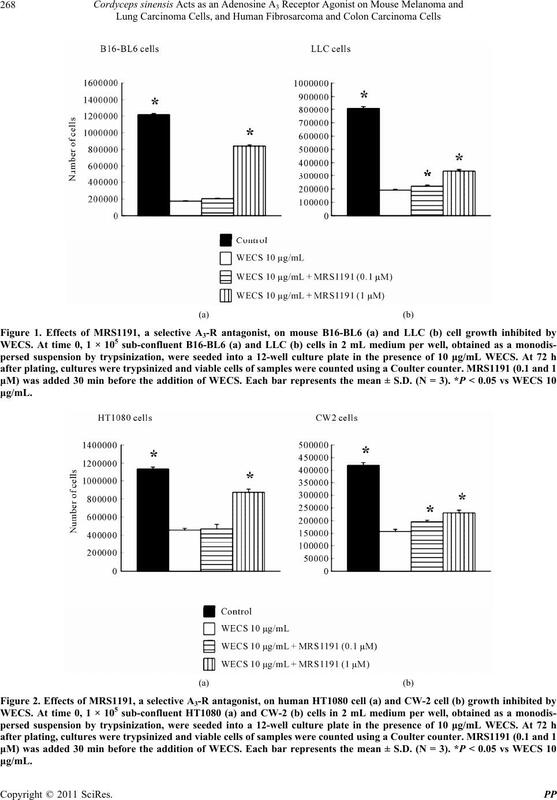 main component in WECS with anticancer action might be cordycepin instead of adenosine. and B16 mouse melanoma cells . cordycepin in WECS using the HPLC-ECD system. from Cosmo Bio Co., Ltd. (Tokyo, Japan). tured in EMEM containing 10% FBS and a 1% NEAA. Z1; Beckman Coulter, Inc., Tokyo, Japan). authentic cordycepin and adenosine, respectively. CA). Differences were considered significant at P < 0.05.
significantly antagonized to 69% of the control value. and 38% of the non-treated control at 72 h, respectively. higher than that of adenosine (0.12% w/w in WECS). 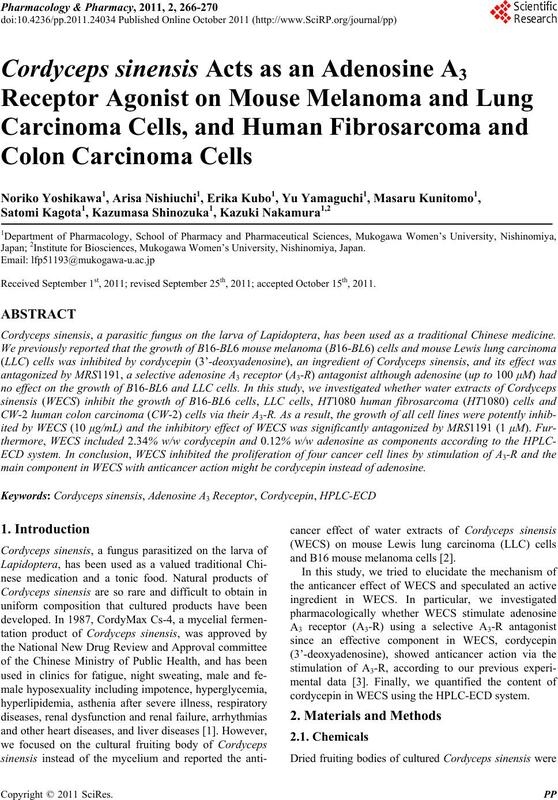 ponents also contribute to the anticancer action of WECS. cantly antagonized by the selective A3-R antagonist. 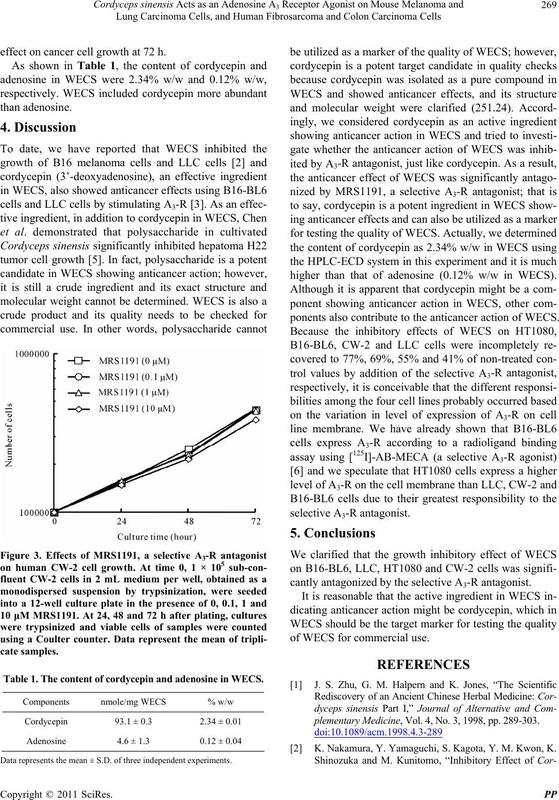 of WECS for commercial use. plementary Medicine, Vol. 4, No. 3, 1998, pp. 289-303. 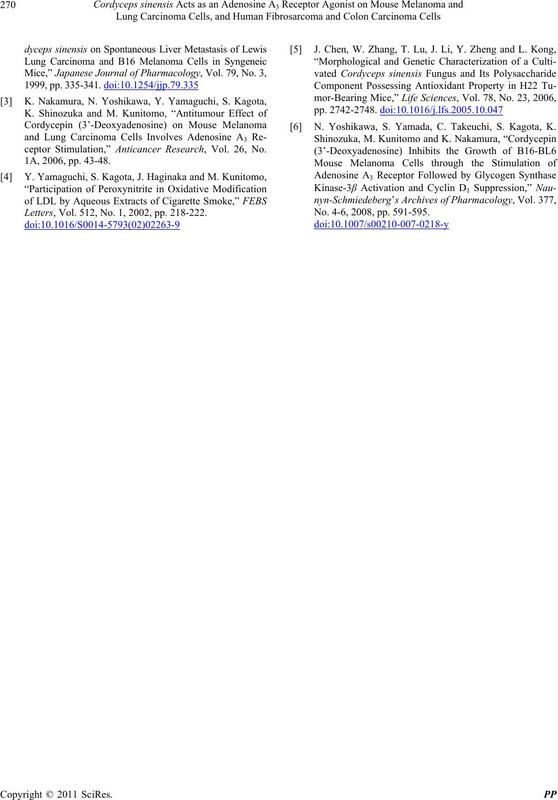 Adenosine 4.6 ± 1.3 0.12 ± 0.04  K. Nakamura, Y. Yamaguchi, S. Kagota, Y. M. Kwon, K.
Data represents the mean ± S.D. of three independent experiments. 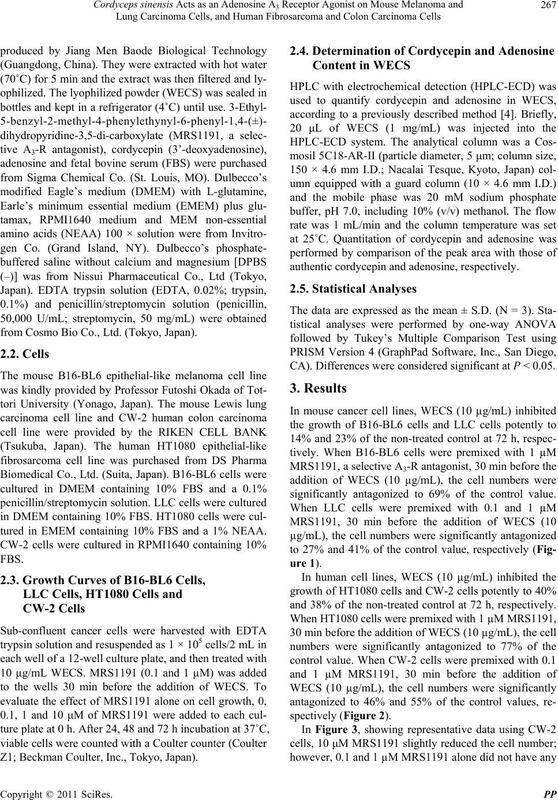 ceptor Stimulation,” Anticancer Research, Vol. 26, No. Letters, Vol. 512, No. 1, 2002, pp. 218-222. N. Yoshikawa, S. Yamada, C. Takeuchi, S. Kagota, K.
No. 4-6, 2008, pp. 591-595.